A cable access television crew of three takes to the wilderness in search of the Jersey Devil. When only one of the crew members returns, it is assumed he murdered the other two. But after the footage from the excursion is found by a local filmmaker, doubts arise over who or what killed the two crew members. Sound familiar, in a Blair Witch sort of way? Before you jump to the conclusion that The Last Broadcast (1998) is a knockoff on the found footage horror craze of the late 1990’s, realize that The Last Broadcast preceded The Blair Witch Project (1999) and may have influenced Blair Witch. Presented as a documentary titled Fact or Fiction, the ultra-low budget Last Broadcast switches between footage found in the Pine Barrens of New Jersey and interviews with key characters and those with theories regarding what happened. By design, the shaky footage remains ambiguous, keeping up the mystery of whether the lone survivor is a cold-blooded killer or if a monster is loose in the woods. We only see bits of each scene, allowing our mind’s eye to work on its own. While a good plan, my impression of the footage is it is too shaky and overdone, as though the movie tried so hard to make the footage look realistic that it overcompensated and made it look contrived. The Blair Witch Project suffered similarly. Some of the details of what happened in the woods are creatively filled in via use of a psychic recruited by Fact or Fiction to lead them along. This plot line seems a bit forced, but it isn’t too distracting. The acting is fine, and the musical score is surprisingly creepy, considering the extreme budget limitations. Industry estimations place the budget for The Last Broadcast at $900, and no, I didn’t leave off a few zeros. In this light, it’s hard not to consider The Last Broadcast as an incredible achievement. I could produce $900 if asked, but I couldn’t make a movie this competent. Interestingly, The Last Broadcast has a higher star rating than The Blair Witch Project at Amazon, though Blair Witch gets the nod on IMDB. Either way, critics rate these two movies similarly, despite the fact that there is a huge commercial success disparity between them. Perhaps The Last Broadcast’s biggest mistake was to turn the movie into a sort of commentary on how the media dictates opinion. I don’t disagree with the commentary – I’ve made this argument repeatedly. I simply feel it is misplaced as part of a horror movie. As seems a requirement in post-slasher horror, The Last Broadcast climaxes with a big swerve of an ending. In this case, the swerve is so out of left field that I was left feeling a little cheated. Why did I spend nearly 90 minutes of time suspending belief as I studied the footage if the movie was going to blindside me regardless? Although the ending left a bad taste in my mouth, the overall movie experience is a good one. There is something utterly horrifying about the idea of finding photo and video evidence of a murdered crew being stalked or killed. Though the found footage movie explosion quickly became tiresome, it is worth noting how creative the initial idea was. This concept, along with a brilliant Internet marketing plan, was responsible for the explosive success of Blair Witch. 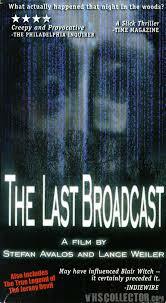 The Last Broadcast experienced little commercial success, but it handled the found footage concept competently. Though I cannot claim I felt afraid at any point during the movie, the total experience gave me a chill. The Last Broadcast isn’t nearly the movie it could have been, but it is still a decent horror movie and an important point on the horror timeline. If you can look past the swerve ending and the unnecessary philosophical commentary, there is a nice little horror movie to be found here. You can find The Last Broadcast on DVD on Amazon.